The Pacific barreleye is an astonishingly peculiar creature, the kind of thing that could only come from a genius, madman or the deep sea. It comes from the deep sea. 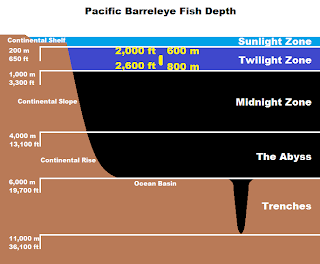 Specifically, this barreleye inhabits depths of around 600 metres (2,000 ft) to 800 metres (2,600 ft), where the darkness approaches absolute black. Clearly this provides ample explanation for that extraordinary head, yes? No? Lets take a look. 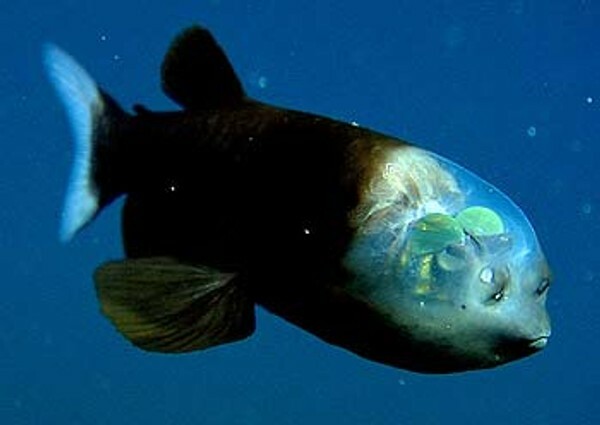 Barreleyes get their name from their large, barrel shaped eyes which are topped by huge green lenses. These are inside a round, transparent, fluid-filled head. I guess if your eyes are INSIDE your head, it's logical for your head to be transparent if you actually want to use your eyes to see. You're still weird for putting your eyes there though, sorry. At least those peepers are incredibly sensitive. They hungrily snap up every last drop of light, all the better to see stuff with. 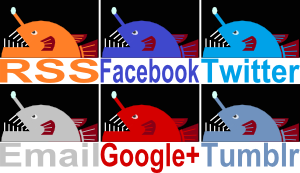 They also both point in the same direction, like mammalian hunters and unlike most fish. This gives them great binocular vision, which improves both their depth perception and their ability to spot faint objects. So how does all this fit together? It seems that the Pacific barreleye starts off by keeping stationary pretty much all the time, with their eyes pointing upward in search of prey. They can make out the tiny silhouettes and the tiny bioluminescence of tiny prey. They can then rotate their eyes so they're forward facing, or rather rotate their body so their mouth is looking up at the same thing their eyes are. Then they can go eat. It's possible they even steal food from the stinging tentacles of the kind of deep sea siphonophores we've seen before. Their tiny mouths could pick out tinier jellyfish and crustaceans, while their transparent head would protect their barreleyes from damage. I'll finish by mentioning what people USED to know about this fish, since it was first discovered in 1939 but only seen alive in 2004. It seems that transparent head is rather sensitive to pressure. Whenever the barreleye was fished up, its head shattered somewhere along the way so that no-one knew about that incredible noggin. They also didn't know that those eyes could move, they thought the barreleye could only look up. This stuff was only discovered when the Monterey Bay Aquarium Research Institute used remotely operated vehicles to record this fish in its natural habitat. A great example of how much more there is to learn and how creatures we may think seem rather humble, may in fact be extraordinary in ways we can't even imagine. There is surely much more to come! WORLD'S COOLEST DEEP SEA CREATURE! You may well be right! It's certainly a top contender. This surely does look like something scary. I never even knew it existed before reading your post. I'll let a friend of mine know about it since he's into the marine life. Please do. 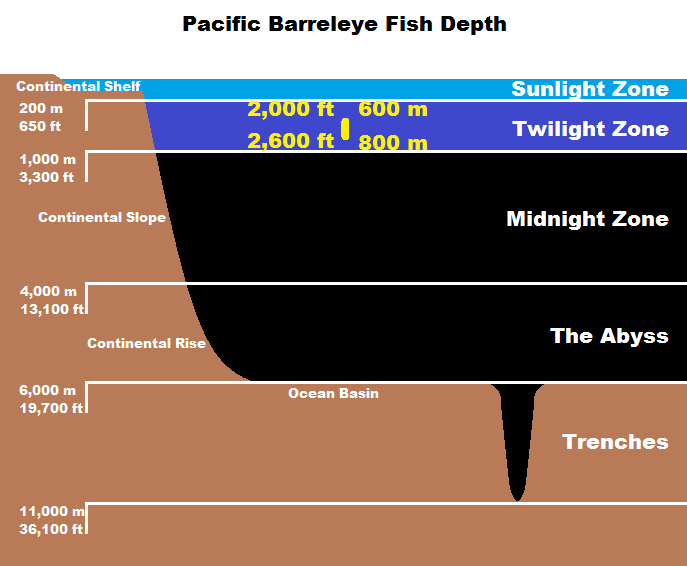 Everyone should know about the barreleye!